We spent our 25th Anniversary sailing around the Windward Islands and the last 4 days we spent on the Platinum Coast at a lovely bungalow on the beach. 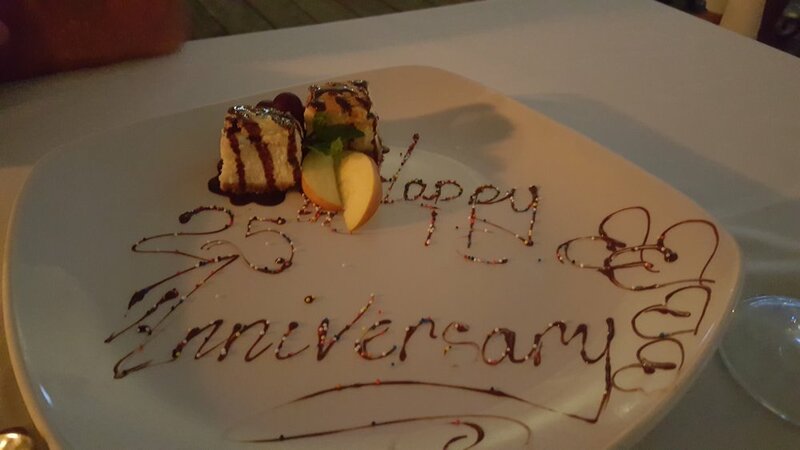 The last night we celebrated our Anniversary with dinner at The Beach House http://www.thebeachhousebarbados.com/. Restaurants in Barbados are not inexpensive and if you are on the West Coast you can find some of the most outrageously expensive ones. The Beach House has as good a view, if not better than the higher priced places like The Tides, The Cliff or even Cin Cin,, and the food and service were exquisite. Now if you are hoping to get a glimpse of the rich and famous, such as Rhianna or Simon Cowell you may choose the higher priced placesl; we were told that is where they go to be seen. The setting is incredible. We were fortunate enough to be seated right next to the edge with an amazing view of the cliffs, with the waves crashing up making for a very dramatic scene. While we were dining the moon was rising right out of the ocean, making it even more spectacular. The minute we arrived the staff was courteous, welcoming and extremely professional. They greeted us, wished us a Happy Anniversary and let us know that we would be able to pace ourselves, and that there was no need to rush. We started with a rum cocktail as we recalled what an amazing 25th Anniversary trip we had had, and what a great way this was to end it. For our first course Mike had the crispy local pork belly, with a pea and mint puree and a sweet red wine reduction. I chose the pan seared diver caught sea scallops finished with a tangerine gastrique. Both dishes were incredibly light and flavorful. We chose them because we both love the way pork belly and scallops pare together. For our second course Mike ordered the bacon wrapped chicken breast stuffed with feta cheese, with a pesto mash and fresh julienne vegetables and a rosemary, thyme and chive cream sauce. I chose the seafood stir fry with the fresh catch of the day, shrimp, scallops and lobster served with stir fried vegetables and finished with a squeeze of lime. Both dishes were perfectly prepared and presented. The flavor was out of this world. The seafood stir fry was subtle but flavorful and the chicken was robust and mouthwatering. We pared dinner with some lovely wines that the waiter recommended. We ended the evening with a night cap and were too full to order dessert. But because it was our anniversary we were served two amazing deserts anyway. The first was decorated with Happy Anniversary in chocolate and it was bite-sized cheese cakes with fresh fruit. 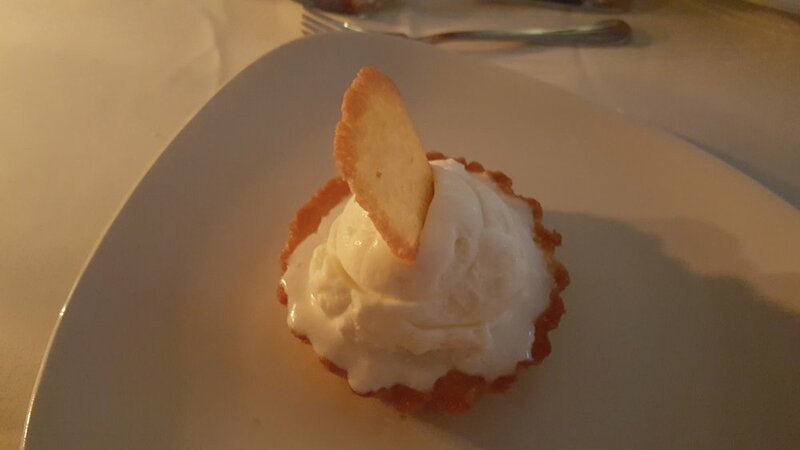 The second was a light pastry cup with a tart citrus custard topped with coconut gelato. We did not need them, but that didn't stop us from thoroughly enjoying them. If you find yourself in Barbados for a night or a week you must put The Beach House Restaurant on your list!